The outdoor living trend is steadily increasing, as homeowners convert backyard spaces into unique cooking and entertainment centers. State-of-the-art appliances, combination grill units, outdoor wet bar, and stainless-steel cabinetry can all be planned to fit within your outdoor space and your family's budget, but what about the utilities you’ll need to hook them up? Modifications to your home utilities can account for a significant portion of your outdoor kitchen installation. A closer look at the costs associated with extending your utilities can help you decide between gas, propane, electric, charcoal, and wood cooking units. Homeowners sampled by HomeAdvisor say the average cost of an outdoor kitchen is around $11,700–with a high-end installation costing approximately $35,000. Of course, this depends on your appliances and furnishings, along with the costs to extend your utilities. A budget-conscious installation could opt for propane cooking units and exclude running water, as an alternate plan. Natural gas will burn cleaner and is usually less expensive than propane gas units. Along with the outdoor gas grill, a side burner, smoker, gas oven, and outdoor heating are benefits of using natural gas. Gas line extensions require a person highly confident in their DIY plumbing skills or a certified contractor. Also, these modifications may require a local permit and will certainly need to adhere to local building codes. The new gas line may require its own shut-off valve and selection of the right pipes and fittings. Careful measurements are required to accurately determine the pipe lengths and routing needed to correctly interface with your gas appliance connections. Consider the professional cost which can range from $120 to $1,300; a reasonable price for peace of mind. Outdoor lighting fixtures, refrigeration and convenience outlets all require ground fault circuits–or receptacles that act quickly in cases of mechanical impact or moisture infiltration. Depending on how many you’ll need, the cost can be as low as $125 for simple electrical additions. For a totally electric outdoor kitchen, an electrician may recommend a dedicated circuit panel installation with its own main breaker. This will reduce the strain on the home's electrical box and would be necessary if enough empty circuits of the correct amperage are not available. The best advice is to leave electrical upgrades to the professionals who know the local codes and the proper wires, breakers and outlets to use. 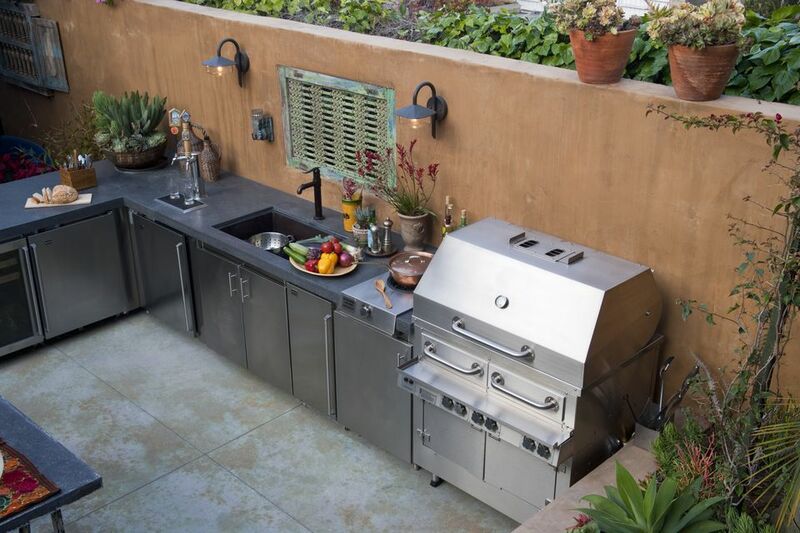 Setting up the outdoor kitchen with running water is one job that could possibly be handled by a skilled homeowner looking to add an outdoor utility sink or a running faucet for the wet bar. Additional costs can occur when you install a hot water line, the pipe insulation required to prevent winter pipes from freezing, and the separate piping to outlet wastewater to the home's drainage system. The costs associated with outdoor plumbing include lengths of pipe and appropriate valves to control the flow of water. It's best to plan your outdoor kitchen location near the home. This way pipe connections are more easily tied to the existing house plumbing. Consider plumbing installations can span a wide range depending on the amount of piping, demolition, and restoration required. The typical range averages between $350 to $1,800. Outdoor living will continue to be a hot trend for homeowners looking to extend their usable living space or spend more time enjoying the fresh air. The best outdoor spaces are designed to minimize maintenance and increase comfort. By extending your utilities, you can create a fully-functioning and totally comfortable outdoor kitchen and entertainment space.